I had a game of Force On Force with a friend today. We played Busy Day In Kandahar, which is a slightly modified version of a scenario from the Operation: Enduring Freedom sourcebook (modified to turn the USMC soldiers into Canadian Forces troops, plus some victory condition tweaks). The game lasted about 4.5 hours and it was a blast. Every time I play FoF I like it more. Between the way the battle played out and the random events thrown in by the Fog Of War cards, a proper little narrative develops - events not directly related to the battle situation begin to snowball and turn into full-fledged side-stories. 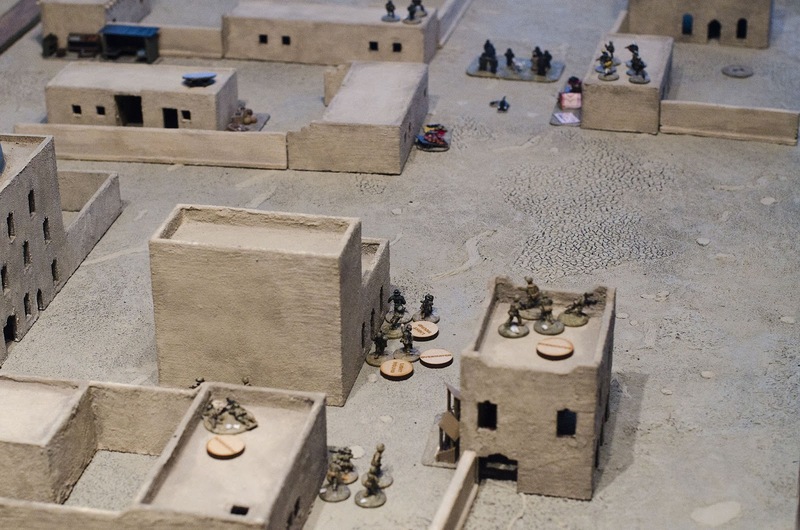 The scenario pits a Canadian Forces (CF) platoon, with support, against a whole bunch of Taliban. 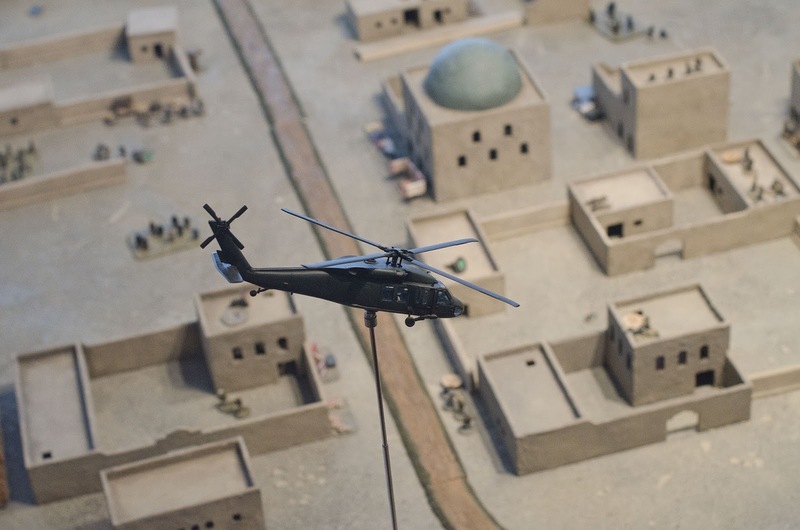 The CF have divide their attentions among three objectives: first, in the NW quadrant, they are tasked with recovering a wounded soldier and extracting him across the board to the Helicopter Landing Zone in the SW. Second, in the NE, they have to provide protection to an EOD team disarming an IED under the guns of the Taliban. Third, they have to clear the HLZ of all Taliban in line of sight to provide a safe area for the helo to land. Together, it's a pretty tough list of objectives for the Canadians to achieve. The Taliban, as usual, earn victory points for killing / wounding / capturing CF soldiers. The Taliban are terrible troops, but there's a conveyor belt of reinforcements arriving all the time, and their victory conditions make no mention of losing troops, so they can sacrifice whole squads in the hopes of doing a bit of damage to the Canadians. 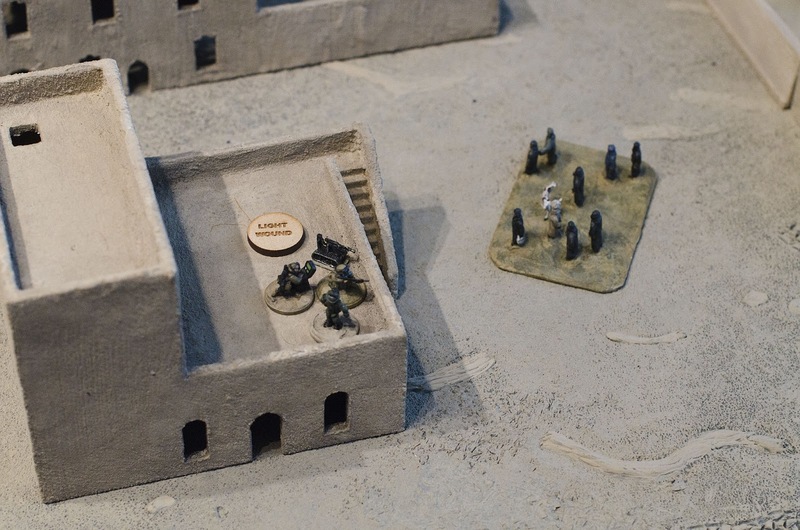 Initial deployments, viewed from the SW. CF section 1 stacks up in an alley with the EOD team up ahead, waiting for the infantry to clear the area. The LMG takes an overwatch position on the roof to their left, and the CF sniper is badly placed at the start of the fight, out of picture to the south. To the NW, Canadians deploy in a compound ahead of their attempt to retrieve their injured comrade (that little black dot visible at the very top of frame). Looking at the west side from the north. In the clearing between the compounds you can see the injured CF soldier, looked over by a couple of Taliban cells. The Canadians suffered a serious casualty in the firefight with the Taliban, but wisely called in a smoke mission from the off-board artillery to mask their recovery of the soldier, and were able to get him to safety . Meanwhile, at the top of frame, a cluster of civilians emerged from the building where the Taliban were taking cover and approached the Canadian soldiers, begging for help with a child who had been wounded in the fighting. The CF were able to render assistance, but the presence of the civilians complicated matters a great deal. Canadians set up to cover the EOD team on the east side. Farther up the street, the EOD robot examines the IED while the Taliban gets ready for action. West of the IED you can see a Taliban sniper team flipped on its back, having been PID'ed and wiped out before getting off a shot. After a few turns the battle has begun to take shape. 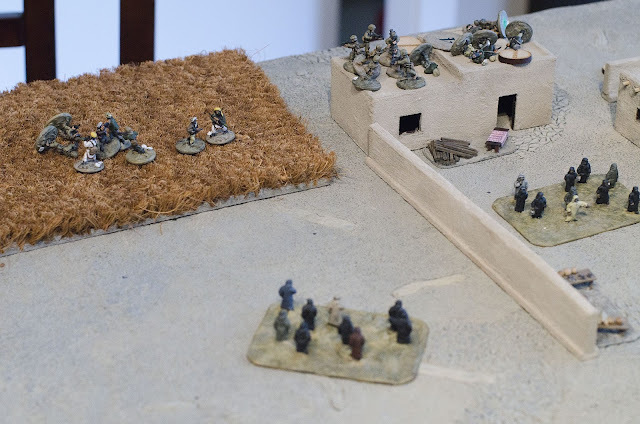 A Taliban cell at hotspot 3 hunkers down to cover the HLZ - this hotspot was key, as the Taliban kept funnelling troops into it as they got mowed down by Canadian sniper and LMG fire so that they could deny the HLZ to the Canadians. 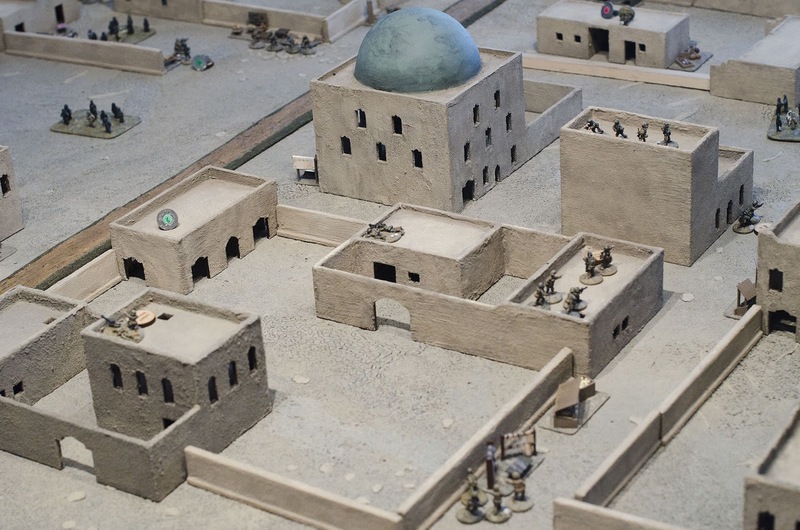 The Taliban had bigger and better plans for that area, but that building was a killing zone so they couldn't form up for a counterattack. Meanwhile, to the north, The Canadians in the compound engage in fire coming from the compound in the north and the smallish building to the west. 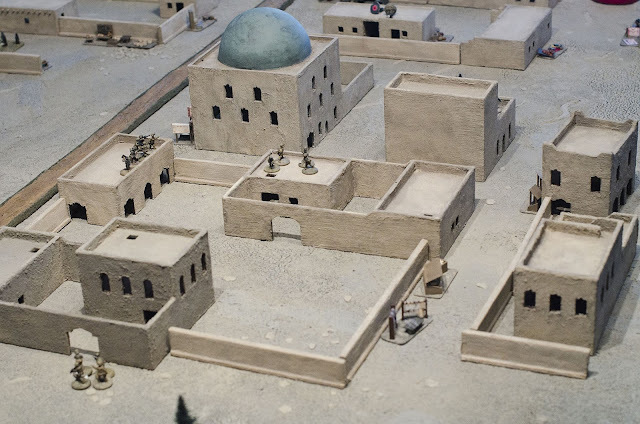 The civilians in the courtyard of the small building make it very hard for the Canadians to bring fire to bear on that building, which will have a huge influence on the outcome of the fight. The sniper and LMG on the rooftops that caused the Taliban so much trouble in the south. 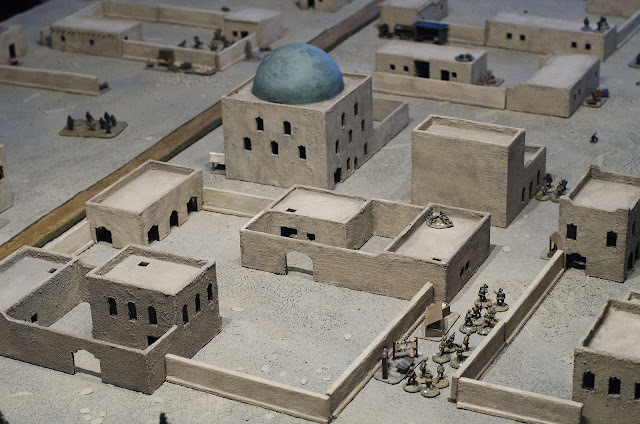 To the northeast, the Taliban had been pretty much wiped out entirely and the IED had been disarmed, so the Canadians were beginning to fall back to the HLZ. Here we see a bold play by the Taliban that eventually cost the Canadians the game. The 2 Section command element (leader and medic) had approached the civilian base to try to disperse it, but fell casualty to Taliban fire. 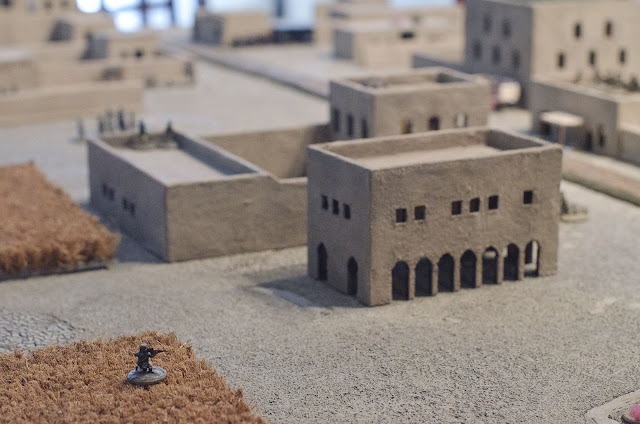 Before the Canadians could get another team in place to check on them, the Taliban darted out of the building and took them captive. The Canadians were reluctant to shoot into a group that contained their own people (and was interspersed with civilians), and couldn't quite catch the Taliban to launch an assault, so the CF command team was still captive at the end of the game. The Canadian medevac helo waits above the battlespace for the call to land and pick up casualties, but the call never came. A sandstorm had blown up, restricting movement, and it became impossible for the CF to extract to the HLZ in the time they had available. The EOD team, with the IED disarmed and no Taliban remaining in sight, hunker down and wait for the resolution of the fight elsewhere. Canadians scramble to assist the fight in the west, but with the sandstorm forcing them to move slowly, they can't get there in time. A single Taliban sniper covers the HLZ, but it's enough to render it too dangerous for the helo to land. Final disposition of the fight in the west. 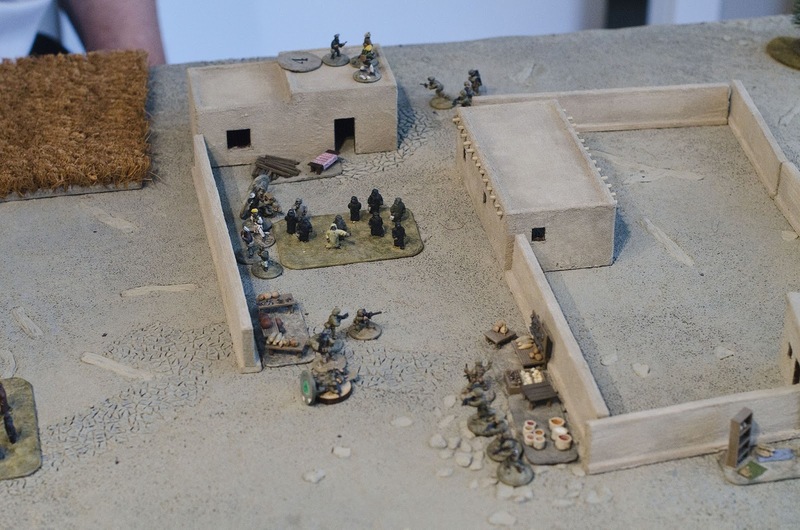 The Taliban disappears into the field with their captive soldiers, while the CF clears the building and gets ready to give chase. It's too late, though, as the Taliban have just enough of a head start to make good their escape. The game was great fun and the result was very close. The Taliban won by a literal inch, as the escaping cell with its captives was just that far ahead and, the way the turn cycle worked, they couldn't be caught. With some more turns in the game they would have been dealt with, as there was really nowhere for them to go and the other CF section was on its way to cut them off, but we reached the end point before that could happen. Force On Force (the scenarios in the OEF sourcebook, anyway) give the Coalition forces a tough job. The Coalition victory points are all objective-based, so they have to control the battlespace and stay focussed on the mission; the Taliban, on the other hand, get victory points for injuring, killing, or (especially) capturing Coalition soldiers. 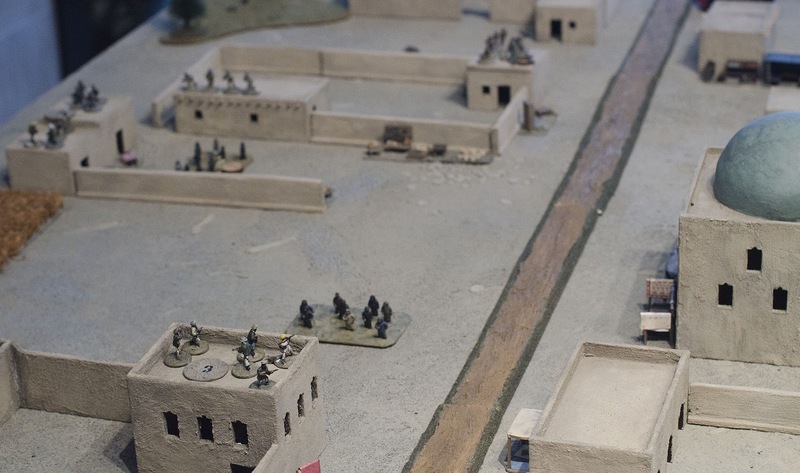 The Canadians can (and often do, like in this game) take out dozens of Taliban troops, but they gain no direct advantage from causing casualties. The Taliban have pretty terrible troops and they have a hard time getting casualties on the Canadians, especially when the Canadians are in hard cover, but they just need to keep throwing out firepower in the hopes of causing damage. Add in all the counter-insurgency restrictions on the Coalition actions, and the Canadian game becomes a very difficult balancing act. 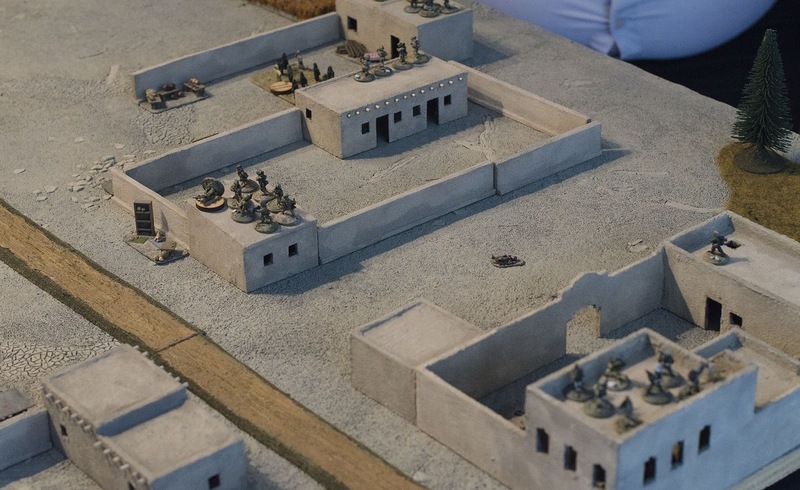 The Canadians performed extremely well in this scenario, and just lost by that crucial inch that made the difference between recovering their captured soldiers or losing them to the Taliban. Great report and pics, sounds like an epic game and a bad day for the Canadians! Nice battle report and pictures it looks fantastic. Thanks for the comments chaps. The result was a loss for the Canadians, but it was too close to call all the way through until the last turn, which kept things tense and exciting. The Canadians just fell victim to a sneaky and dirty ploy by the Taliban.